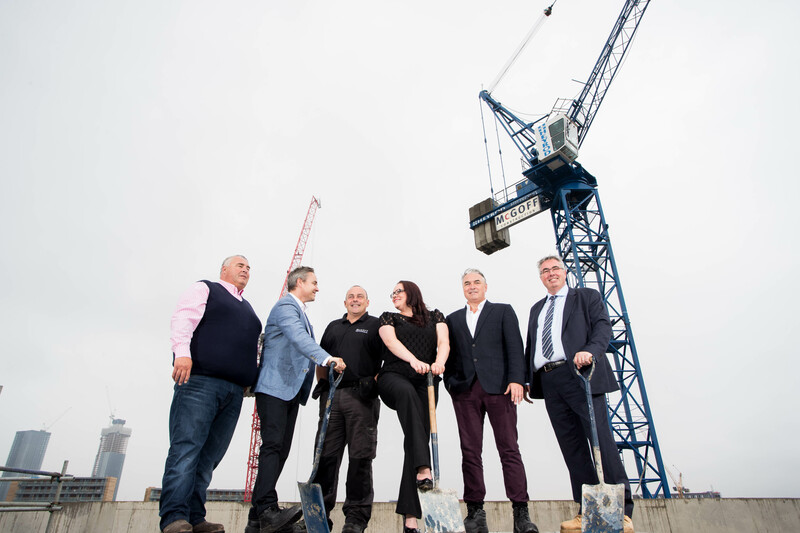 With the concrete frame complete at phase one of Downtown, the McGoff Group celebrated this key milestone in the construction programme with a topping out event on the roof of the Woden Street development. Joining the McGoff brothers James, Declan, Dave and Chris was the team from Wellesley, the development property finance specialist that has provided £39.9m funding to deliver Downtown. Combining a successful construction schedule, with the build expertly executed and managed by multi award-winning McGoff Construction, and impressive sales with all 368 apartments sold, the build of phase two at Downtown will now start much earlier than planned. Occupancy of phase one, which comprises 160 apartments, is planned for March 2019, and the early commencement of construction on phase two, which comprises 208 apartments, will start imminently. Chris McGoff, director at the McGoff Group, says: “The success of Downtown has been superb both in terms of sales and construction and it was fitting to invite the team from Wellesley to the topping out event on the roof, giving them the chance to see the impressive progress made on site. Graham Wellesley, Founder and CEO at Wellesley, adds: “Downtown is a high-quality, aspirational apartment scheme and the impressive pace of sales fully supports this. Working with the McGoff Group on this project has been a pleasure and it was a privilege to attend the topping out event. “Since 2007 property developers have found it increasingly hard to secure funding from banks and building societies. As a specialist alternative lender, we work hard to fill this gap, providing flexible lending packages that meet their needs.